I've done a variety of fostering and transporting to help various rescues. Southern California shelters are perpetually overflowing with chihuahuas and chihuahua mixes. Meanwhile, there are plenty of places around the country where little dogs rarely show up in shelters at all. My theory is that cold winters limit their population. Obviously the solution for this problem is to export chihuahuas from our overcrowded shelters to places where tiny rescue dogs are in high demand. Some of our local rescues have teamed up a couple of times to drive dozens of chihuahuas to Montana. Merlin's Magical Carpet Ride is amazing, dogs that had been sitting in shelters for months got adopted within days of arriving. When I lived a bit further south, I used to work with rescues in New York and Minnesota to pull dogs from Los Angeles County shelters and fly them to their forever homes. This was an adventure because I often had just over a week between pulling the dogs and taking them to the airport. The biggest challenge was getting them comfortable in their crates. 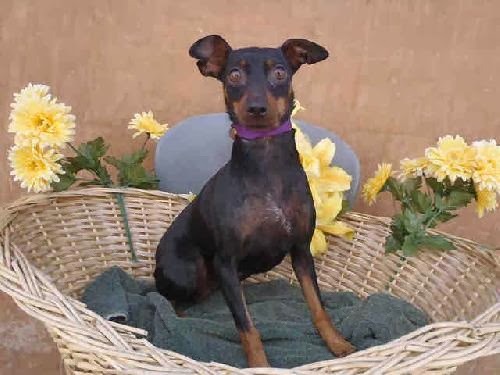 This little black and tan miniature pinscher is Wanda. She was picked up as a stray and ended up in a shelter in Los Angeles. Wanda was my biggest crate training challenge, she would hang out in the big crate in the livingroom, but her little airline crate was apparently terrifying. She absolutely refused to go in willingly, panicked and screamed hysterically for hours when forced in, and never calmed down on her own. Treats tossed in the crate and left with her always remained uneaten. The beginning stages of crate training can be trying, especially if the dog really needs to be confined overnight. I've heard plenty of people told to just put the dog in there and ignore the screaming, but realistically we all need to get sleep. People in apartments or with less-tolerant housemates may not be able to wait through a weeklong extinction burst while their dog has a panic attack in the crate all night, every night. With Wanda, the clock was ticking and I had to invent an entire new crate training method. The entire process took about three hours the first night, 15 minutes the next, and after that Wanda went into her crate with minimal fuss. I have only tried this with one dog, so if you attempt it please let me know how it goes. 1. Block the dog into a limited area, and make the crate the most comfortable option. I put the crate in a corner of the bedroom where Wanda could see me in bed, and then used a combination of furniture and baby gates to confine to an area of bare floor. Her options were to sleep on the hardwood, or go into the crate with her comfy blankets. If I had to do this in a carpeted room with a dog that didn't mind sleeping on the floor, I might try putting a fan in there to make the floor drafty and the crate more inviting. If the dog would go in the crate for food I would just toss something tasty in there and skip to Step 3. 2. Wait for a while. Wanda took maybe 15 minutes to decide that braving the crate was better than sleeping on the cold floor. I was extremely patient and just ignored her and read a book while she considered her situation. 3. With a less panicky dog I would have tried closing the door after they were in and settled, but this sent Wanda into hysterics immediately. She needed to learn to relax and stay put without the door enforcing the lesson. Instead, I decided to just stand in front of the crate so she couldn't get out. There was no door to frantically claw, just a person she trusted standing comfortably close. This might not work as well on a dog with a less developed sense of personal space, but Wanda seemed to find it comforting rather than confining. 4. When she finally settled down, probably 15-20 minutes later, I attempted to step back from the crate. Wanda popped up and tried to get out, so I again blocked the door with my legs. She settled a little faster, and eventually I was able to inch away again. 5. I learned not to move away too fast, but keep inching away, stepping back again to block her if she tried to leave. I probably spent well over an hour just standing there a couple of feet from her crate. 6. When I could climb into bed without Wanda stirring, I could also quietly close the door. The first time she woke up and we had to do the whole song and dance over again. With a light sleeper I might try pushing the door shut but not latching it. If housetraining wasn't a huge issue I could also have tethered her or just left her blocked into her corner for the night and then tried again the next night.